The same child is used repeatedly for "different" rescues. The White Helmets is a scam. ​One of the largest sources of propaganda promoting "intervention" in Syria has come from the White Helmets. They have also used the name “Syrian Civil Defense”. The White Helmets were not created by Syrian nationals, nor does the White Helmets serve the interests of the Syrian state, or the Syrian people. The White Helmets were created by a collaboration of Islamists inside the US and UK in 2013. But, in 2013, the Syrian Armed Forces were winning the battle against the Islamist takeover, and in order to reverse this, the Islamists needed an "intervention" that would assist and support their Islamist armies inside Syria. The Free Syrian Army’s Farouq brigade was extremely knowledgeable regarding media and social networking. The group had experts who produced dramatized videos for the television networks of Qatar (al-Jazeera) and Saudi Arabia (al-Arabiya). Hence, from these already experienced creators of "documentary-style" propaganda films, came another outlet of propaganda: The White Helmets. Muslim Brotherhood groups in the UK, the US, and the "Syrian National Council", a Syrian Muslim Brotherhood group, were all involved in the start up process of the White Helmets. Then, immediately following its creation, $13 million dollars was given to the White Helmets, part of which came from a non-governmental organization (NGO) tied to George Soros. The White Helmets have been repeatedly linked to George Soros through a public relations firm named Purpose Inc., an organization that promotes Western intervention in Syria. The co-founder of Purpose, Jeremy Heimans, also founded Avaaz, another anti-Syria, pro-Islamist group connected to George Soros, and also connected to MoveOn.org. Another major contributor to the White Helmets has been the United States Agency for International Development (USAID). USAID donated $16 million to the White Helmets (2). It is no coincidence that the US State Department began calling for Western intervention in Syria at the exact same time as the White Helmets propaganda began. The White Helmets propaganda campaign made false accusations that gave the U.S. "cause" to support Western intervention in Syria. The “rescue workers” you see in the propaganda videos are only filmed in “opposition held” neighborhoods, neighborhoods held by al-Qaeda and Free Syrian Army. There are more than 20 "opposition" armies fighting for an Islamist takeover in Syria. They hit civilians neighborhoods every day. Yet not once have the White Helmets ever shown up to rescue anyone in those areas. FACT: The White Helmets only conduct "rescues" in opposition-held neighborhoods where the opposition has total control -- and where opposition members live and reside. FACT: Together, the Free Syrian Army and al-Qaeda in Syria (aka al-Nusra), have conducted many massacres of civilians throughout Syria (6) and have targeted many civilian neighborhoods of Damascus and Aleppo with barrel bombing and rocket fire until neighborhoods are completely demolished. The photos you see of blown out, rubble-ridden neighborhoods, are neighborhoods that were vacated years ago. These areas are perfect places to stage White Helmet "dramatizations". Additionally, you will rarely see a woman in any of their films. Islamists do not like to have their women filmed; you will only occasionally see a woman--and she is always wearing full Islamic garb. In a real bombing in a real civilian neighborhood, there are many women. And Syrian women are always with their children -- it is an integral part of the Syrian culture. To be uncovering all of these children without any mothers either close by or right next to them, is absurd. So ask yourself, why is it you are always shown children being rescued out of the rubble? And why is it that every photo of rescued children looks almost identical? If these are "by-chance" cell phone photos and videos, hurriedly taken after an alleged bombing, why do they all look alike--rescuers running towards the camera? If these photos are occurring on different days, different months, even different years--why do they all look the same! These propaganda films primarily use children knowing that you will feel so much compassion that you will forget to use logic and intellect when seeing them. Many White Helmet "rescue" workers have been filmed socializing with al-Qaeda in Syria (aka al-Nusra), but also the "Free Syrian Army" (a Muslim Brotherhood group). They are seen celebrating "wins" with other terrorist groups, and even participating in executions. Why would they participate in executions if they are medical rescuers? They have even been filmed waving the al-Qaeda flag. The White Helmets are members of terrorist groups. The White Helmets use their own children for their dramatized photos and videos, and occasionally, their wives (see photos below). These terrorist groups behave exactly like ISIS in that they never allow humanitarian aid to enter the areas they control. They never allow in ambulances, medical aid, not even medicine, once they take and occupy a neighborhood. They have never allowed "rescue" workers to enter the neighborhoods they have control over. The White Helmets / Syrian Civil Defense serves as a tool for Western governments to feed their media with false information. By misrepresenting the group as "impartial activists" or as a "humanitarian organization", the media thereby uses them as a reliable "source" to propagandize the western public into believing there is a reason to back the Islamist groups -- the "opposition". The same photo is used in February 2015 and then again eight months later in October of 2015, each time after an "alleged" bombing took place. 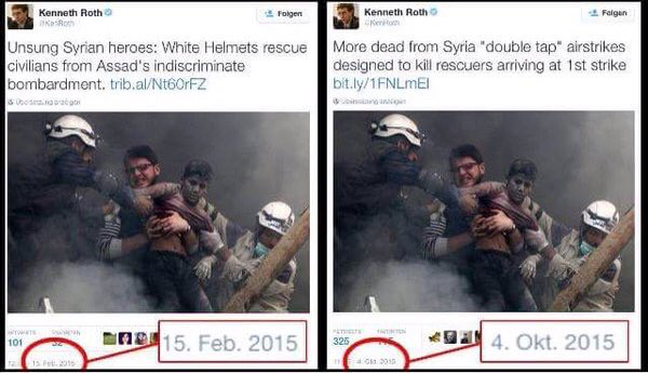 This is a common tactic of the White Helmets: using the same photos over and over. A White Helmet "rescuer", who is also a member of al-Qaeda, and another White Helmet member who is seen waving an al-Qaeda flag in celebration of a recent takeover of a neighborhood. 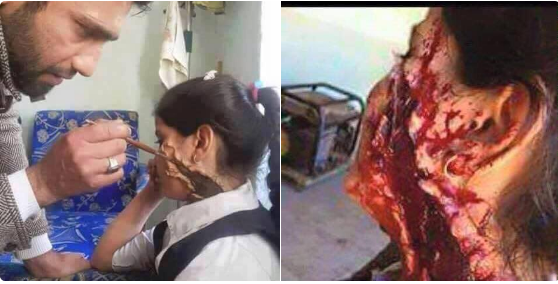 ​One is getting her makeup applied; another photo shows dead chickens in which the "blood" will be used for the child's fake death; another with his mother faking injury (and then proudly holding a photo of themselves faking the injury).